Song Mansion project by Jordan Kutev Architect Inc.
New single family residence located in prime British Pacific Properties //www.britishproperties.com West Vancouver, BC. Song Mansion is located on the steep hills of British pacific properties, taking advantage of the sweeping 360 degree views of Downtown Vancouver, the ocean and Stanley Park. The main goal of our design team was to take full advantage of the stunning views and combine fully indoor and outdoor living activities in all seasons. Due to higher grades differences, the residence was designed in 3 levels, adding an internal elevator for convenience. The lower level is mainly entertainment areas which includes a large Rec room, library, media room, Gym, wine cellar and tasting, karaoke room and so on, with several exterior pools and hot tub. 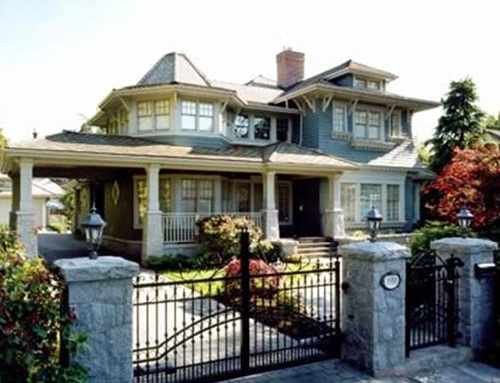 The style of their preferences is French provincial also known as Provence / French Country, adjusted to the more urban settings of Deer Lake, Burnaby. Floor area 15,000.00 sf + 4 car garage.